Sometimes I’m not sure it’s going to work out after all. I mean, we have been together 20 years, but sometimes my beloved says stuff that makes me wonder. 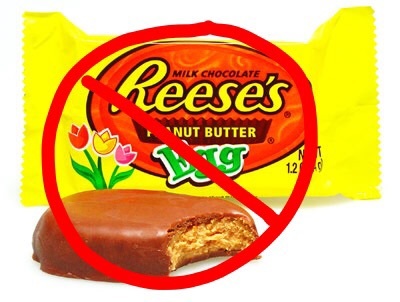 Take this afternoon, for instance, I was casually mentioning to my husband that when I go to the store lately, I fear for the lives of all poor innocent Reese’s Peanut butter cups. The thought started developing last week when I accidentally forgot to fast forward through a commercial for Halloween candy. 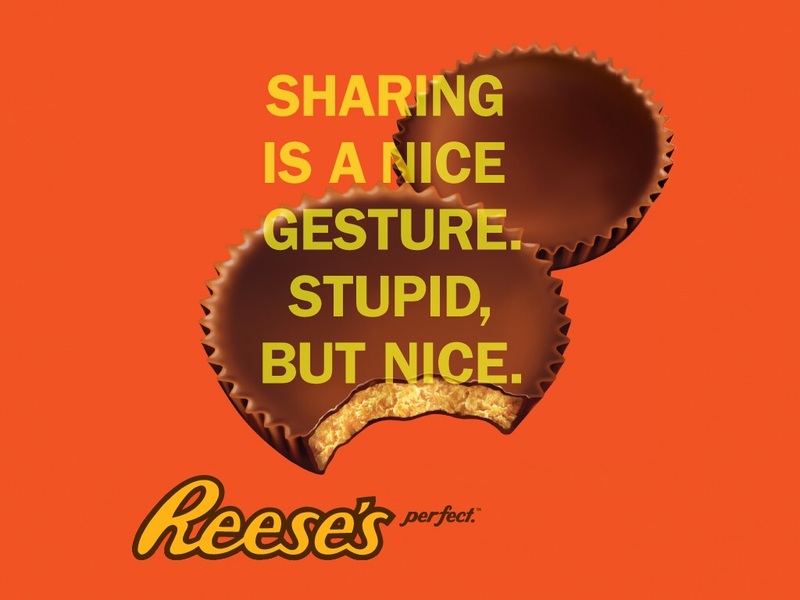 I covet Reese’s. A lot. I think that the last time I imbibed was at Christmas last year. I’m due. And I informed my spouse of my Reese’s entitlement sharing that I have abstained since last Reese’s Tree Season. He raised an eyebrow. Seriously, though, we all understand that the MOST acceptable format for Reese’s is the tree habitus, right? 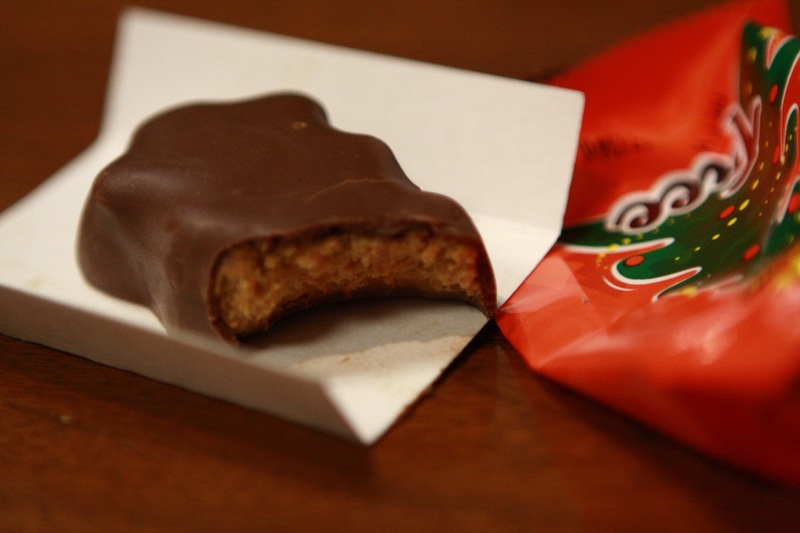 That way, you can consume the Reese’s loveliness one tree tier at a time. Three perfect bites of peanut butter and chocolategasm. The second most acceptable shape is, of course, the classic cup. The primary benefit of cup consumption is the crunchy crinoline petticoat of milk chocolate happiness–the cocoa zig zags that you scrape off of the top of the cup with your teeth prior to the only appropriate Two Bite Method of mastication. Crinoline scraping plus the TBM? Three steps. Aside–yes, I’m dead serious and, yes, everyone wants a ‘me,’ poor Kevin. When cloning hits its stride, there’ll be Pams on every corner. “They all taste the same to me” he said. Oh, he got me started, alright. First, an egg takes FOUR BITES to dispose of properly. Four. Bites. Unacceptable. Furthermore, while lingering in the misery of too many bites, your fingers sink into the oddly shaped amoebic blob. There is no decent place to grab an egg, forcing a strange cramping pincer finger ridiculousness that leaves the thumb and pointer finger coated in wasted chocolate. This flagrant resource wasting leads to inevitable multi-finger sucking. Gross. Finally, the egg shape starts, becomes and remains turdlike in appearance for the entirety of its life cycle. This is NOT passable. Not peachy OR keen. Not hunky OR dory. Are you catching my drift? I know, right?! And I’m MARRIED to a man who doesn’t get it. How could I be expected to continue under these conditions? Therefore, your honor, I submit Exhibit A: Irreconcilable Reese’s Differences. Post Script- while serving up dinner tonight, I needed to combine scalding ingredients from three hot pans onto plates in a specific order and it was tenuous. He jumped in when I experienced a utensil failure and when I started quoting Clint Eastwood, “Improvise. Adapt. . .” He jumped right in with, “Overcome.” So all is forgiven. I’ll keep him now. This entry was posted in confessions of the Weird and Unashamed, Just Being Me, Mawaige is what bwings us togefah and tagged humor, marriage humor, Reese's cups, Reese's Eggs, Reese's Trees. Bookmark the permalink.